Menopause 731™ contains Siberian rhubarb (R. rhaponticum) extract standardised for two unique compounds: rhaponticin and desoxyrhaponticin. In pre-clinical studies, this unique extract selectively activated a specific estrogen receptor, ER-β, while leaving the ER-α receptor alone. Scientists believe this is why Menopause 731™ relieves widespread menopausal discomfort. The standardised extract in our Menopause 731™ formula has been studied in randomised, placebo-controlled clinical trials ranging from 12 weeks to two years. Results were measured by standardised research questionnaires designed to evaluate menopausal discomforts; as well as a specialised survey that rates patients’ mood and emotional health. This extract produced significant relief for 11 distinct menopause discomforts, especially for women experiencing hot flashes, night sweats, irritability and mood swings. Remarkably, study participants reported improvement in all of their discomforts, including sleep disturbances, exhaustion, joint and muscle discomforts, and vaginal dryness, as well as urinary and sexual health. Don’t rely on outdated supplement formulas that address only one or two aspects of menopause. 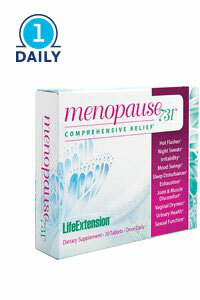 Get comprehensive menopause relief – add Menopause 731™ to your regimen today!